Seemingly lost in the news of iTunes, the AppleTV, Amazon’s forthcoming online video streaming service, and the newly available Netflix set-top box from Roku, is Vudu. 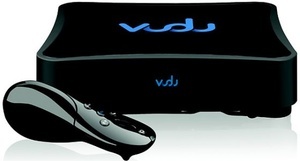 Vudu, the movie-on-demand service with its own set-top box, has upgraded its software to version 1.5 — ho hum — but this upgrade includes the ability to extend the rental past the 24-hour deadline. One of the loudest complaints from people who rent or stream video content over the Internet is that they’re given 24 hours to watch a movie once it has started. If the baby interrupts and you can’t get back to “Atonement” in time, tough. You’ve got to rent it again to finish. Vudu now allows you to extend the rental period for $2 off HD movies and $1 off regular flicks. The option is available for a week after the movie expires; once chosen, you have another 30 days to watch, 24 to 48 hours (depending on the film) after you hit play. The extension is available only once, although we wish it was without an additional cost [Ed. all rentals should be viewable for 48 hours at no extra cost. The studios are just being plain greedy and demonstrating that they still don’t understand viewing habits. Have they never heard of “no late fees”?]. It’s a reasonable amount of time to finish what you started, or watch again. It’s also something that others — ahem, iTunes — should offer as soon as possible.